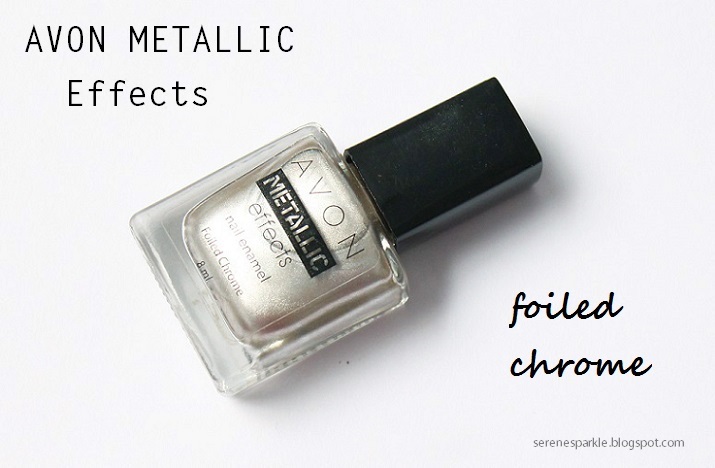 Avon metallic effects nail polish comes in this square glass bottle with rectangular opening cap. I like its consistency which is neither too runny nor too thick and the brush applicator is just normal and not very wide.It does give a smooth and even application.However two coats are needed for an opaque finish.The color is a stunning metallic silver which gives a foil look to the nails and the finish isn't super shiny,it's bit matte. You can top it off with a transparent top coat for extreme shine.It also contains very fine silver glitter which only shows up under direct sun light. After 2 coats it takes 5-6 minutes to dry completely. Now coming to the staying power, I'd say it has pretty decent staying power.It did chip a teeny tiny bit after three days of applying it but there was no bad chipping at all. I really like this silver with light hues of gunmetal color.It doesn't look extremely loud on nails. And over all I don't find anything negative about this nail paint except for the fact that I feel it's slightly overpriced at 250 bucks.This is my first avon nail polish and it didn't disappoint me. I'd love to try other shades in the metallic range but at the same time I wish they bring down the price at least a little bit. It's a gorgeous color but true slightly over priced. The shade is pretty. I like that it has mild gold hints to it. Amazing colour. I really like.